When a long-time customer of Velocity Factor comes into our shop to make his beloved ride unique, we’re always happy to tackle the Job. This 2012 Nissan 370 Z is affectionately known as “The White Rose” and owned by a serious car enthusiast. If you haven’t seen her on the roads of South Florida, you can certainly find her at the many car shows throughout the area as the owner regularly attends many of them. This particular Z is customized from tip to tail in every way possible! A Varis front bumper, side skirts, and rear bumper accompanied by an authentic NISMO rear wing, start it off, followed by custom paint, carbon fiber hood scoops, and accents throughout the car. 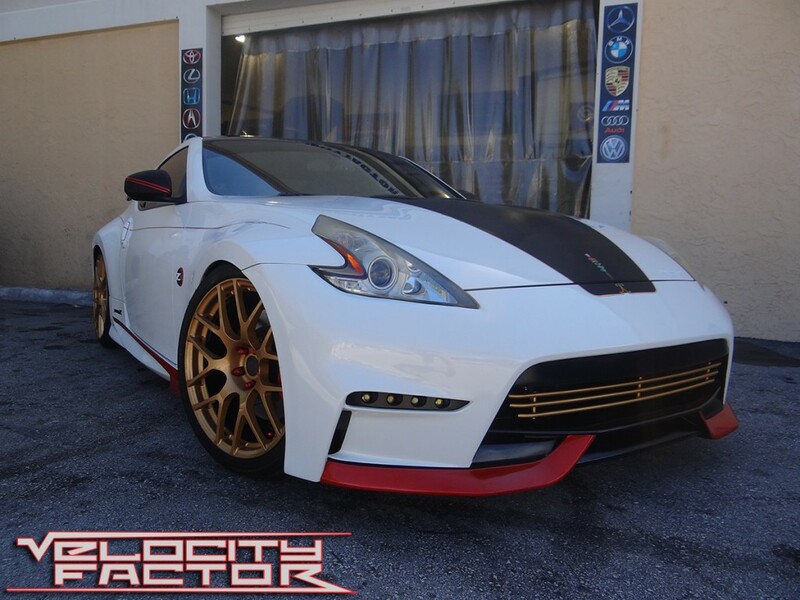 The blending of white, black, and red trim with the gold TSW wheels and red Project Kics wheel lugs gives this 370 Z a unique and pronounced presence on the road. Velocity Factor installed custom LED headlights and “strips” on the front bumper with custom in-dash controls and switches. Under-hood a K&N FIPK Cold-Air Intake was installed to allow colder charge air into the engine, and out back a beautiful looking and sounding ARK “GRIP” Stainless Steel Performance Exhaust was installed for maximum breathability and a deep, rich, sporty tone. H&R Sport Lowering Springs were installed and they certainly give the car the proper ride-height without compromising everyday drivability. The brakes have custom painted calipers done by Velocity Factor and have been upgraded with high-performance Hawk brake pads as well for increased stopping power. The car has custom wrapped side view mirrors, ceramic window tinting, a touchscreen control unit for the entertainment system, and much more! 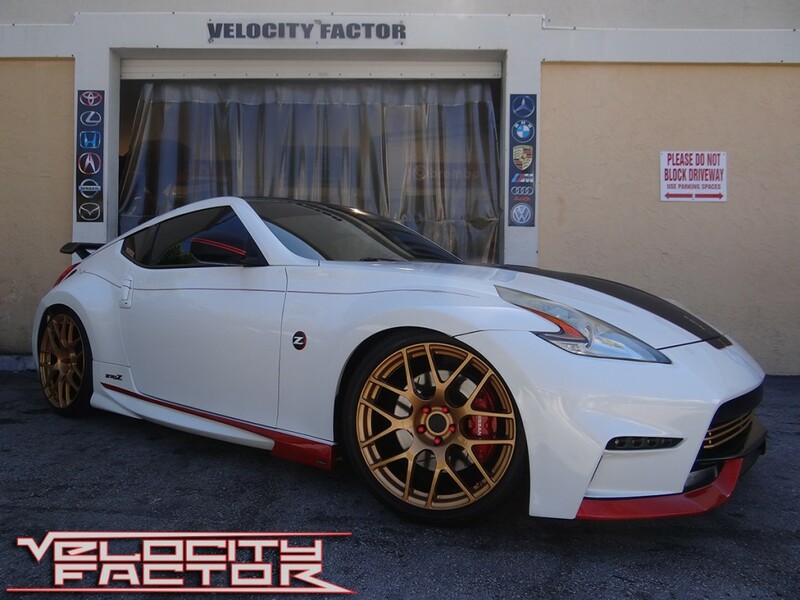 This is a 370 Z that turns heads everywhere it goes and it’s proudly adorned with the Velocity Factor logo. Do you have a car that you’d like to make unique, special, and all your own? Need some performance upgrades or cosmetic enhancements? Then look no further because Velocity Factor has you covered! 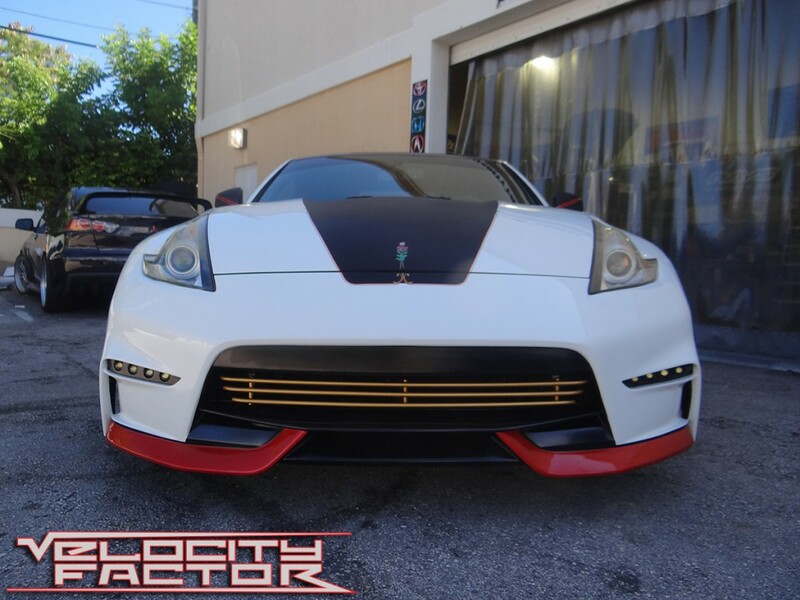 From custom wheels, to suspensions, brake systems, exhausts, turbo and supercharger kits, custom tuning and more there’s nothing the team at Velocity Factor can’t do for you and your car! Come visit our showroom located at 980 N. Dixie Highway in Boca Raton, call us at (561)-395-5700 or send us an email at: sales@velocityfactor.net to get in touch with one of our automotive specialists. Velocity Factor is open Monday through Friday from 10am to 6pm and Saturdays from 12pm to 4pm. We look forward to seeing you and making your car or truck the very best it can be!